What are the sources of teaching authority in the Catholic Church? What are the sources of teaching authority in the Protestant church? The image below demonstrates the difference. 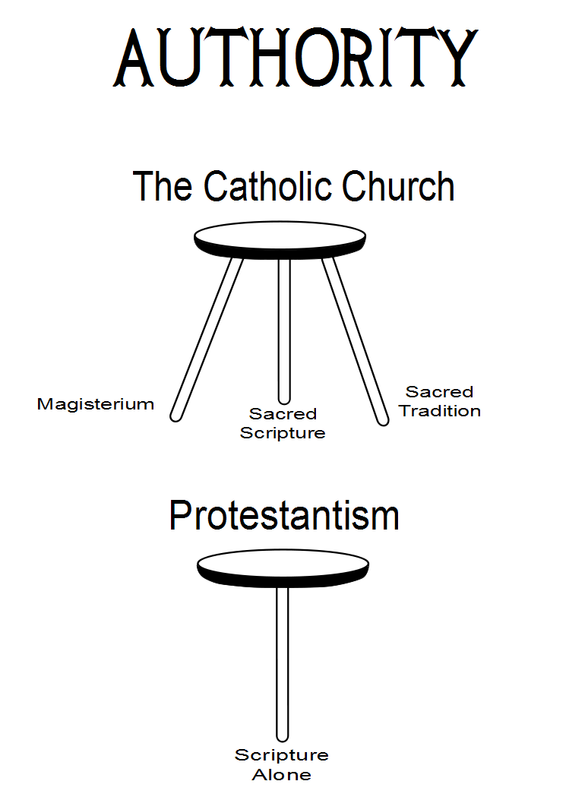 This difference is a key reason why I choose the Catholic faith over the evangelical/Protestant faith. During this article I will attempt to justify my belief on this issue while allowing the reader to discover for him or herself which option is best. First, I will outline the Protestant or evangelical belief to the best of my knowledge, which is based on light research. If you notice any mistakes or would like to clarify a point, then please make a comment below. I’m more than happy to change what I write if it is incorrect. Let’s take a look at a few biblical verses that appear to support sola Scriptura, or Scripture alone as a basis for teaching authority and doctrine. 1) “All scripture is inspired by God and isuseful for teaching, for reproof, for correction, and for training in righteousness,so that everyone who belongs to God may be proficient, equipped for every good work,” (2 Timothy 3:16-17). 2) “I have applied all this to Apollos and myself for your benefit, brothers and sisters,so that you may learn through us the meaning of the saying, ‘Nothing beyond what is written,’ so that none of you will be puffed up in favor of one against another,” (1 Cor. 4:6). 3) “These Jews were more receptive than those in Thessalonica, for they welcomed the message very eagerly and examined the scriptures every day to see whether these things were so,” (Acts 17:11). For Protestants, these verses are convincing. Apparently, they show that Scripture is the only standard in Christianity. Why, then, do I disagree with the Protestant reading of these passages? In the first quote from Timothy, note that Paul says that Scripture is useful, not that Scripture is the only authority in the Church. There is a difference between usefulness and unique power. In the second quote from 1 Corinthians, Paul is quoting a common saying from Jewish schools around the Roman Empire. The instructors would teach their students to write by exactly copying the instructor’s letters. In the context of this passage, then, Paul is asserting that the Corinthians should follow Apollos and him exactly. They should not part from Paul’s arguments and Paul’s doctrine. Furthermore, the New Testament had not been fully written or compiled when Paul wrote 1 Corinthians. He could not possibly be telling his friends in Corinth to follow books that had not yet been redacted! In the third quote from Acts, we find that Scriptures help to support the Christian message, which they do. However, we find no comment about sola Scriptura in this verse. Clearly, these verses demonstrate that Scripture is important and necessary; however, they do not in any way suggest that the Bible is the only source of Christian teaching. Now, let’s consider a few biblical verses that support the Catholic understanding of the sources of Christian doctrine. 1. “So then, brothers and sisters, stand firm and hold fast to the traditions that you were taught by us, either by word of mouth or by our letter,” (2 Thess. 2:15). 2. “What you have heard from me through many witnesses entrust to faithful people who will be able to teach others as well,” (2 Tim. 2:2). 3. “So faith comes from what is heard, and what is heard comes by the preaching of Christ” (Rom. 10:17). 4. “’But the word of the Lord abides for ever.’ That word is the good news which was preached to you” (1 Pet. 1:25). 5. “Whoever listens to you listens to me, and whoever rejects you rejects me, and whoever rejects me rejects the one who sent me,” (Luke 10:16). These verses make the following obvious: not only what is written is essential, but also what is spoken. Additionally, Paul commands his followers to entrust the truth to “faithful people.” These faithful people, in Catholic understanding, make up the Church. They pass on the fundamentals of the faith throughout the ages. The faithful do not contradict Scripture in the slightest; they fortify it and complement it. Please leave a comment if you have a question or a statement to add. May the Lord bless you in abundance. May He unite you with the one, holy, catholic, and apostolic Church founded by Himself.